Rome’s architectural box of magic tricks welcomed Zaha Hadid's Maxxi Museum to its collection in 2010 as it slowly continues to paint the picture of modernism in Rome to juxtapose it’s vista. The Maxxi: Italy’s first National Museum of Architecture, and Rome’s latest contemporary art gallery. It's beautiful, non threatening, anti garish but still daring. But what is it wearing, as in, what art works adorn it’s walls. Is it the Wonderbra of the museum world? The internal red black and white tricolour pleased me so much so, I would have been thrilled to walk around the museum space as an empty structure, had a tea at the bar, and been on my merry way. 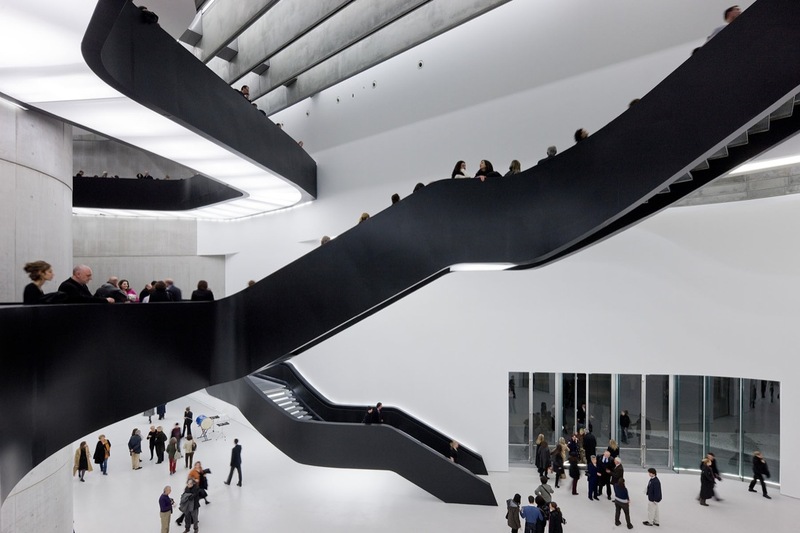 Hadid is flawless, not faulting her for a mili-minute, because what I got out of the Maxxi was exactly that – the architecture inside and out. What hangs on the walls then equally enthralled me, making the ticket worth the ticket. Including Alighiero Boetti's work, which I especially liked. There was no way Boetti’s name could go unmentioned and 30 of his works, many unseen, recounted his journey to Rome as an outsider, and the reaction he formed which inspired his creations. The exhibition is described as the relationship between an artist allergic to definitions, and the city which became a springboard for the unknown, exploring identity. There was Giuseppe Penone’s ‘Sap Sculptures’ an art installation, combining leather, wood, resin and marble, which was more like it. It blew me away, which is what an art gallery should do. This natured theme installation reminiscent of tree bark, has a wooden totem covered in resin to represent the sap, which was very tactile. For 45 years Penone has examined our relationship to nature, producing impressive sculptures. This piece was total escapism and a pretty far out display. The internally tubular dancing that went on inside Maxxi’s walls really did tickle my toes, but it wasn’t the complete experience that the Tate Modern in London or the Pompidou Centre in Paris can provide. Nevertheless, it does have a certain inside outside overall wow-dom. Its site being on an old Carabinieri barracks is pretty cool. A big female drop of design on a most masculine military site. Why female? Must be the award winning female architect's touch, matched with it’s curvy (it’s practically a serpent) structure, plus it’s non domineering statement. I see as more endearing and welcoming. The Maxxi is a breath of fresh air and was a much needed missing string to Rome’s bow and a compliment to Rome’s ever expanding modern architecture portfolio. For Rome, exhibit wise, the Maxxi has a tough time competing with Palazzo Esposizioni’s mammoth and ever changing, up to the scratch and down to a T. bombastic modern vernissages. The cost of an annual Maxxi membership is 50 euros, and Rome, who just loves hosting parties, wants to invite you to sit and have an aperitivo at the trendy Maxxi’s cocktail bar, which offers a lovely external view of the Maxxi architecture in full frontal mode. Open Saturdays until 10pm, it should be added to your diary, so book the Maxxi in to your spring agenda as it is well worth your time and wallet, if only for the outstanding architectural momento. It’s perfectly accessible, for those of you lucky enough not to drive in Rome, it is a mere tram’s throw from Piazza del Popolo. For those of you who have just tuned into Rome’s architectural digest, and may not have had the luxury of exploring the works of art by the latest contemporary practitioners in Rome, they are as follows, Renzo Piano’s Auditorium, Richard Meier’s Millenium Church and Ara Pacis, and of course the Zaha Hadid’s Maxxi Museum, the subject of today’s meeting. Meiers, Piano and Hadids monuments which complete Rome’s architectural rainbow, are not bad names to drop for an ancient city. They merely complete, but don’t compete. It is complimentary.